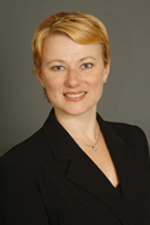 Olga Simanovsky practices in the area of labor and employment law with particular emphasis in the area of employment litigation, including workers’ compensation defense. She provides both counseling and litigation services to public and private companies. Ms. Simanovsky handles all aspects of employment litigation, including wage and hour matters, discrimination claims, employment contracts, retaliation claims, sexual harassment claims and Americans with Disability Act issues. In the area of workers’ compensation defense, Ms. Simanovsky primarily represents self-insured employers. She manages cases from inception to conclusion, handling all aspects of analysis, discovery, negotiations and litigation. Ms. Simanovsky’s experience includes many depositions, hearings and trials, with numerous defense verdicts. She has substantial experience defending 132(a) discrimination and serious and willful claims. Ms. Simanovsky is also experienced in handling product liability appellate work, general liability litigation, personal injury litigation and criminal defense matters. Ms. Simanovsky joined Hinshaw in January 2004. Previously, she was a senior associate with Kegel, Tobin & Truce where she specialized in the area of workers’ compensation defense litigation. One of her primary clients was the County of Los Angeles. Ms. Simanovsky also worked as in-house counsel for a private company in Portland, Oregon, where she negotiated and prepared vendor and service contracts, and ensured compliance with municipal contracts. She also handled consumer complaints and other legal disputes, and maintained the company's corporate documents. “Worker’s Compensation Update 2005,” at the Council on Education in Management, in Los Angeles, California, May 2005.